Proponents of a higher target say dealers' lots won't look much different in 2025 than they do now: from trailer-towing trucks to subcompacts, with only a small percentage of electrics. But innovations under the hood -- from better gas engines to newer hybrid technology -- could save consumers thousands of dollars on gas, offsetting anticipated higher sticker prices. The Consumer Federation of America endorsed the 56 m.p.g. target, after its extensive surveys found U.S. consumers wanted more fuel-efficient cars. Because most buyers pay for a vehicle over time, CF's analysis concluded, consumers save much more on gas costs each month than they would spend on higher car payments for more fuel-efficient vehicles. David Friedman, deputy director of the Union of Concerned Scientists, agreed. "From the moment they walk off the lot in 2025, they'll be ahead of the game from where they are now," Friedman said. "Every month, they'll see reduced expenses." An analysis last year by EPA and NHTSA calculated four cost scenarios for 56 m.p.g., and estimated that while the increase in the typical vehicle available in 2025 could be $2,100 to $2,600, a consumer would make all that money back from fuel savings in just two to three years (based on about 15,000 miles driven each year). [S]upporters of 56 m.p.g. see pure electric vehicles and plug-ins as a much smaller percentage of the market by 2025. "It's not electrics that are going to get us there," said the Union of Concerned Scientists' Friedman, predicting electrics might reach 5% of the market. Instead, he said, it would be improvements on conventional gas and diesel engines, as well as more and new hybrids. The hybrid component -- in a wide spectrum of forms -- could ultimately bring the biggest change. Three of the four EPA and NHTSA scenarios calculated last year for what the 2025 fleet could look like at 56 m.p.g. found plug-in or pure electrics as a blip -- but the penetration of hybrid vehicles ranged from 25%-65%. That doesn't mean a world of Toyota Priuses. Rather, a whole range of new options from stop-start to so-called mild hybrids to more robust electric-gas combinations will enter the automotive bloodstream. This year, General Motors is unveiling its new Buick LaCrosse and Regal with a feature called eAssist -- a tiny electric motor that boosts the gas engine's mileage. It's a mild hybrid. The driver might not even know it's happening, at least until realizing the full-size LaCrosse is getting 36 m.p.g. on the highway. Kessler notes that "The CAFE program also uses what it calls a "harmonic average." That means small improvements in the worst performers can make a bigger difference than large increases in already-efficient vehicles. The SUV going from 15 to 20 m.p.g. could save more fuel -- and count for more in the CAFE system -- than a subcompact going from 50 to 65 m.p.g." 5. Baby steps by the worst performers count as giant strides. CAFE is based on consumption (gallons per mile), and uses a "harmonic average" -- that means small improvements in large SUVs and sedans make a bigger difference than jumps in vehicles already topping the efficiency mark. 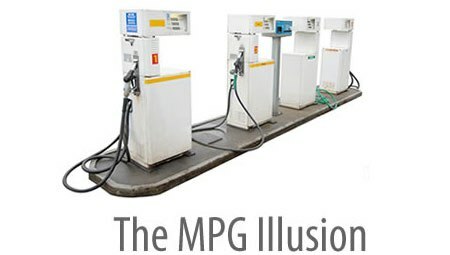 Baby steps by the worst performers count as giant strides because they are giant strides: Small improvements in MPG on the worst performers lead to larger reductions in consumption than large improvement in MPG on the best performers..